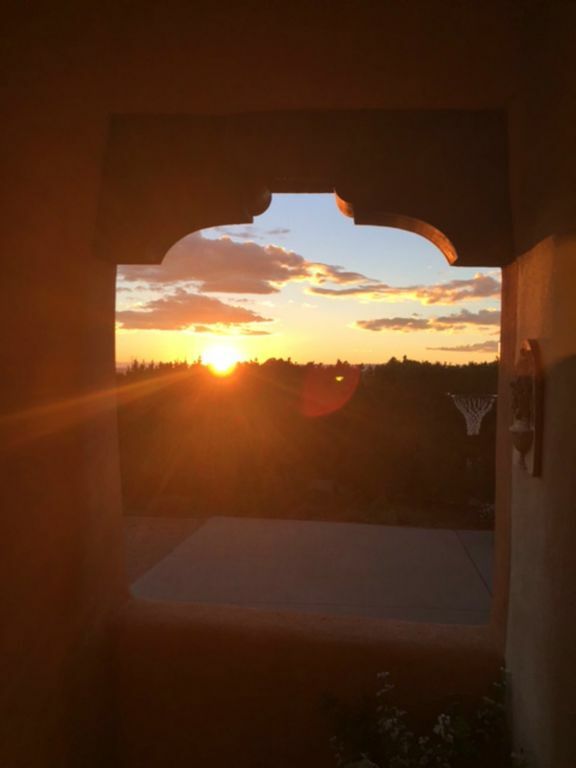 Santa Fe Perfection: Stunning Views. Beautiful Home. Quiet, Serene, Setting. Our beautiful, spacious, light filled adobe home is located on Santa Fe's prestigious East Side. The home offers spectacular sunset, mountain and city views and is situated on an acre plus of treed, landscaped land. It is two miles from the Plaza. The home is 3500 square feet and features a large, comfortable living room with an artistically designed fireplace; large master suite with king size bed and fireplace, luxurious bathroom with jacuzzi and walk-in closet; an additional guest suite with a queen size bed and adjacent sitting area; study with queen pull out sofa; a formal dining room seating up to eight; a large kitchen with breakfast nook and an adjoining family room/den with a kiva fireplace. The public spaces have artistically crafted flagstone floors while the bedrooms are carpeted. The ceilings vary in height from 9 -12 feet all with vigas and different latilla treatments. There are skylights though out the home. The walls are plastered with a smooth diamond finish. The home is elegantly furnished and tastefully decorated with eclectic art. Just lovely. There are two patios: one facing East with an in ground fountain, brick surface, an outdoor Kiva fireplace, umbrella and table. The other patio faces South and West with two fountains, brick and grass surfaces, table with umbrella and barbecue grill. There is a large two car garage attached. A floor plan is available if desired. Pets are not allowed. No Smoking. Our home is ideal for two couples. For more information please call 505 983 7063. The Plaza is 2 miles from our home. City and sunset views, mountain views south, east, and west. One phone connected to DSL high speed internet connection. Bring your laptop. All of the highest quality with shams, colorful covers and elegant pillows for aesthetic purposes. See photo. Can park up to 6 cars in drive and unlimited on street. Large with unique fireplace, vigas, views, hi fi. Newly remodeled with granite tile and new stainless steel applicances. (2) Master bedroom and office/bedroom/den. Picture books and some history and best sellers. Extensive collection from classics to blues. Few for kids if requested. Two patios, each with a fountain and furniture. One has a wood burning Kiva fireplace, the other a BBQ gas fired grill. Nearby at Fort Marcy and other parks. At Fort Marcy which is 1 1/2 miles. Skylights throughout the house for increased light. The house rests on one acre of landscaped trees, bushes and flowers. Charming home offering many thoughtful amenities. The home has lovely outside sitting areas affording a wonderful sunset view amidst a lovely garden. The location was great for going into town or heading up the mountain for a hike. The owners were very attentive and accommodating. If you do not see any reviews other than mine for this home it's because my wife and I have spent five weeks in it every summer for twelve years. If it weren't for personal reasons, we would return this coming summer, and no doubt for many summers to come. Karl and Rosvita, the home's owners, are gracious, wonderful hosts; their home isn't furnished as a sterile, rental-only property. It is truly their home, and the warmth you will while living in it is real. The house is far larger than it might appear. The patio adjacent to the kitchen is perfect for dining outside. The patio adjacent to the living room is larger. You can enjoy dinner or simply stare across the mesa to the mountains in the distance, and watch gorgeous sunsets. The house is a five minute drive from either downtown or Museum Hill, and a five minute drive from the first of one of the amazing trails there are to hike in the area. Before you reach it you'll pass Ten Thousand Waves, Santa Fe's legendary spa. The master bedroom is huge and the master bathtub is also a jacuzzi. The kitchen has everything you need in order to make everything from a cup of tea to a three course dinner. If you use wifi, the house has it; it can even be used outside of the house on one of the patios. If you would like a desk, there's a great, large desk in a home-office. If you like quiet, you'll find it here. The only house remotely close is Karl and Rosvita's guest house, which is typically occupied by a year round tenant who you will likely not even see, let alone hear. And the house, which is immaculate, is even more welcoming and spectacular than the pictures can adequately show. In short, if you want a quiet retreat in a beautiful setting, this is where you'll find it. If you stay there, you'll likely want to return. The home is that special.